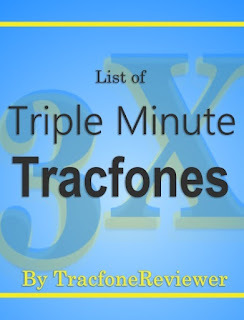 A list of Tracfone cell phones that come with Triple Minutes for Life conveniently organized by TracfoneReviewer for our readers to see which phones are the best deal on minutes. UPDATE: We can confirm that certain newer devices, such as the LG Fiesta, do not come with Triple Minutes for Life. Tracfone is no longer including that feature in certain phones released after April 2017. This may include all phones with Android 6.0 or newer, and BYOP devices activated after April 2017. Read our new post, Facts about Triple Minutes for Life Changes to learn more. Tracfone is a prepaid wireless cell phone company that provides both phones and service. Many of their phones come with a special bonus of Double or Triple Minutes. In this post we will share many of the phones that have Triple Minutes, and help provide details on how Triple Minutes work. 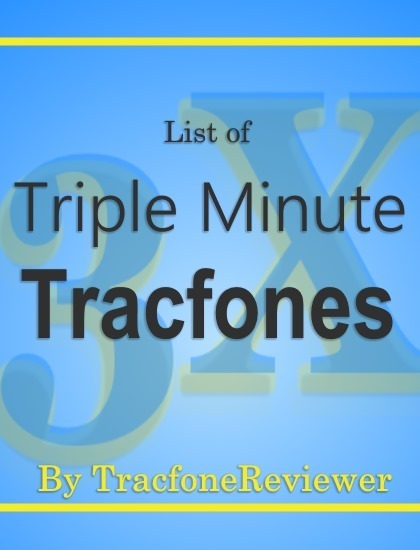 How Does Triple Minutes Work with Tracfone? The way Tracfone service works is you buy airtime cards that come with certain amounts of minutes, like 60, 120 200 etc. When you add the airtime card to your phone with Double Minutes, you will get twice the number of minutes. If you have Triple Minutes, you get three times the number of minutes. So, for example. if you add a 200 minute card to your Triple Minute phone, you will get 600 minutes total (200 minutes plus 400 bonus minutes). And that's before you add a Promo Code! Note: Smartphone only airtime cards do not triple, and can only be used with smartphones, but they are a good deal as we found in our smartphone airtime comparison chart. We have several full posts providing further details on this including, How Do Minutes Work on Android Tracfones. You can also learn about How Data Works on Tracfone Smartphones, and How to Buy More Texts for your Tracfone. Now, here is the list of cell phones form Tracfone with Triple Minutes for life. Because of recent changes by Tracfone, we are including a list of Tracfone prepaid cell phones that come with Triple Minutes for Life and a list of phones that do not have that feature. Found a phone that isn't listed here? Share it in the comments below. To get more info on each of these phones, and read our reviews of them, simply follow the links. 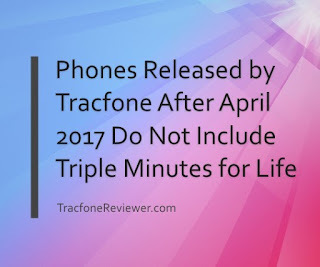 Tracfone Smartphones released after April 1st 2017 do not come with Triple Minutes. We are including the phones from Tracfone that do not come with Triple Minutes. The full details on exactly which phones come with triple minutes is not perfectly clear, but it appears that phones with Android 6.0 or newer do not include triple minutes feature. Some phones that initially had triple minutes, appear to not include that on new purchases (this appears to be the case on the LG X Style). 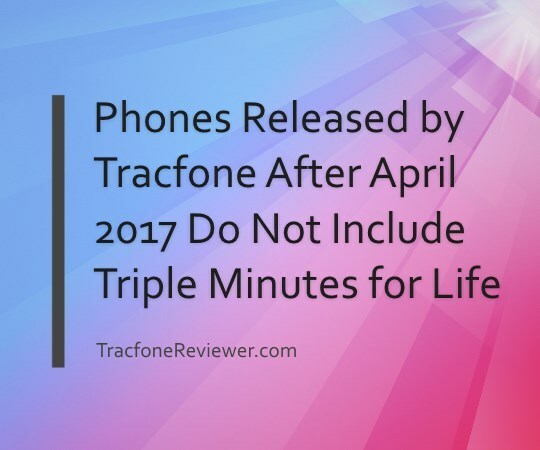 All Android Smartphones released before April 2017 have Triple Minutes for Life - Older smartphones will continue to have Triple minutes, but we expect Tracfone to phase these phones out. These are good options to choose if you're looking to maximize your minutes using the regular airtime cards. Remember, the newer, Smartphone Only cards are generally a better deal (especially for data and texts). Visit our Cell Phone Reviews page or Android Phone List to see more smartphones available from Tracfone. If you already have a phone with triple minutes, you will not lose that. BYOP Smartphones have Triple Minutes for Life - Any phone already activated with Tracfone BYOP program automatically gets Triple Minutes for Life! You can bring a wide variety of phones to use with Tracfone, and learn more about this on our Tracfone BYOP page. And take a look at our list of the best BYOP devices for more options. New Tracfone BYOP SIM kits may not include triple minutes, so be sure to carefully read the packaging to see if it includes that feature. Below are additional devices that are not smartphones, but come with Triple Minutes. LG 306G - One of the newest of the options listed below, this non-Android feature phone has a 3.2" touchscreen, GPS connectivity, and plenty of useful features. Might be your best choice if you're avoiding upgrading to a smartphone. LG 530G - This phone comes with a great QWERTY keyboard making texting fast and simple. It also has lots of other good features like an MP3 Player, and long battery life. This phone has a solid construction and is very durable. LG 505C - A phone with both a touchscreen and slider qwerty keyboard, this phone is very modern and sleek. It also uses the CDMA network, typically Verizon towers, so it is a good option if other GSM Tracfone cell phones won't work in your area. Tracfone Reviewer will be reviewing this phone soon, but until then, you can check it out on Amazon . LG 800G - A slightly older Tracfone mobile device that features a touchscreen and many other good features. This phone, while not the best, can often be found at deep discounts and serves well as a back up or temporary phone. LG 840G - A big upgrade from the LG 800G, this stylish touchscreen phone comes with WiFi and 3G connectivity making it a great value and one of Tracfone's best cell phones. This phone also comes with a MicroSD card, and lots more. Read our full review to see all the great features and the best deals. Samsung S390G - This phone is another great option from Tracfone that comes with a QWERTY keyboard for fast texting, and WiFi connectivity for free internet browsing from the phone. Anytime you are connected to a wireless internet network, you can browse the web without using your prepaid minutes, adding huge value to this phone. Be sure to read our full review by following the link to learn more. Samsung R455C - Another cell phone from Tracfone that uses CDMA networks instead of GSM, this phone has very good features such as a sliding qwerty keyboard, and is a good option for those in areas where Verizon networks have better coverage than AT&T. View this phone on Amazon to learn more about it. Samsung T404G - A slider QWERTY keyboard style phone that is similar to the R455C except that this phone uses GSM networks, like AT&T. Tracfone Reviewer hasn't reviewed this yet, so view this phone on Amazon to learn more. Samsung S425G - An updated version of the T404G, this phone features 3G connectivity making browsing the web faster and easier. It has a full sliding QWERTY keyboard that allows for fast and simple texting, and impressive battery life. Motorola Ex431G - A cell phone built for texting, the Moto EX431 is fairly similar to the LG 530G listed above. It has all the basic features you expect, like MP3 Player, Voicemail and MMS. This phone can sometimes be found for less than $10, making it a great deal. But pay close attention because some versions of this device only come with Double Minutes. Know of another phone not listed here that comes with Triple Minutes for Life? Leave a comment so we can add it! Learn more about the phones Tracfone offers by visiting our Cell Phone Reviews page. And you might be interested in viewing the phones from Tracfone that have WiFI. New to Tracfone? Start with our Beginners Guide to Tracfone which includes lots of helpful details and tips or you can also join our online community on Facebook! The Alcatel One Touch Pixi Glory is a large, budget friendly smartphone available from Tracfone since mid-2016. It comes with a 5.5" screen, quad-core processor, 8 GB memory and Android 5.1. It is for use with Tracfone prepaid service and uses the GSM cell network with 4G capability. In our review of the Pixi Glory we will share the full list of features and specs, look at key pros and cons, and compare it to some of the other popular smartphones available from Tracfone at this time. To see all our reviews of, visit our Tracfone Cell Phone Reviews page. 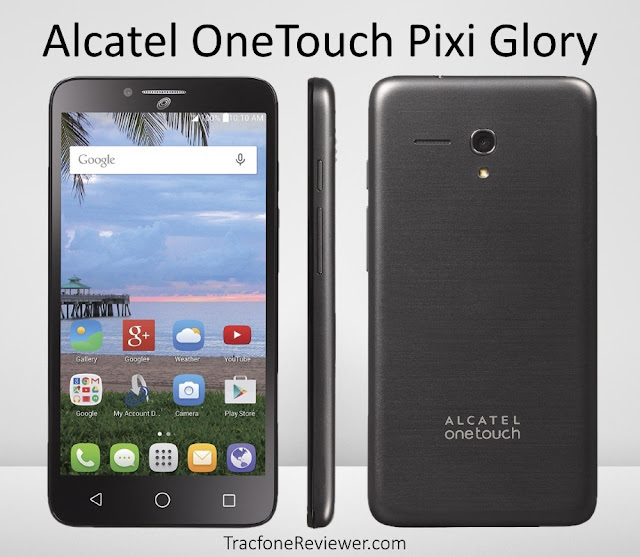 Let's start with the main pro's and con's about the Alcatel Pixi Glory. There are a number of inexpensive smartphones from Alcatel available through Tracfone, with prices ranging from $20 (or sometimes less) to around $100. In general, spending more on a phone means you will get better performance and features, but there are also some great discounts on certain devices. The Pixi Glory, not to be confused with the Pixi Glitz, Pixi Eclipse, Pixi Pulsar, or a number of other similarly named devices, is one of the more recent and better alcatel phones we've seen. Let's see the full list of features and specs to get a better idea what this phone brings to the table. Size: 5.98" x 3.06" x 0.37"
Alcatel is a phone brand licensed by Chinese company TCL Corporation, which is known for a wide variety of electronic products including TV's and various appliances. While the Pixi Glory has a good appearance and feel, a number of the cheaper alcatel onetouch devices feel and look somewhat 'cheap' and occasionally have quality issues. Any phone offered as a budget smartphone will have certain drawbacks in order to keep the price low. Let's take a look at our review, with the key features we like, or found to be lacking. We will start with the features we like about this phone, followed by a few drawbacks. The big feature on the Pixi Glory is the large screen, which is 5.5" with HD resolution (720x1280). For comparison, the Moto G4 Plus also has a 5.5" touchscreen, although it has full HD (1080x1920) resolution for an improved visual experience. The 5.5" screen size means the phone is fairly big by general standards, and can take some getting used to for those accustomed to smaller phones. However, it doesn't take long before the Pixi Glory feels normal, and you are enjoying the larger surface area for reading, watching or gaming. In our experience, everyone has certain preferences on phone size, but a large screen does make it easier to use the phone as long as you can still comfortably hold it. The performance specs on the Alcatel Pixi Glory are not very exciting, but adequate for most activities and should keep up with the majority of apps. Lastly, we are happy to see that even with a large screen, the Pixi Glory is available at a reasonable price of $99 with airtime bundle, and occasionally on sale for less. Now for some negative points about this phone. While the overall performance of the Pixi Glory is pretty good, we don't like that it is limited by just 8 GB internal memory, 1 GB RAM and running Android 5.1. Many smartphone users are looking for closer to 16 or 32 GB memory to store the apps, photos videos and other content. With just 8 GB, the Pixi Glory limits how much you can load on the phone. Tracfone smartphones don't receive OS updates, so the Pixi Glory will always run Android 5.1, which is now becoming a little outdated with Android 7.0 released for many newer (and more expensive) phones. Another point to mention on the Pixi Glory is that the battery is non-removable, so if it dies, you will need to get a new phone. Lastly, we do want to mention the front and rear cameras. The rear camera captures 5 MP images and look OK in good light. It can also shoot HD video (720 resolution) at 30 fps which is adequate for sharing on social media or sending to friends. There is also autofocus and LED flash. The front camera has a 2 MP camera that is more like a webcam and will struggle to take good images unless there is good lighting. Overall the Alcatel Onetouch Pixi Glory has some nice features for the price, and it also looks sleek, just don't expect to be wow'd by the performance. This phone is best suited for consumers who use a handful of apps, but would like a large screen for viewing photos and videos. View the online tutorial for the Pixi Glory for help navigating on this phone. The Pixi Glory can be found at a variety of online retail websites, including the Tracfone website and Amazon, but we've found the best bundle deal is on HSN. Under $100 for this phone is not a bad deal, as it is a capable device for most tasks. One of the best budget phones currently available from Tracfone is the Samsung Galaxy Sky. It has a smaller, 5" screen, but comes with a number of improvements compared to the Pixi Glory, such as 16 GB memory, Android 6.0, and 1.5 GB RAM. The Sky is also often on sale for the same price as the Pixi Glory. Be on the lookout for the new Samsung Galaxy J7, the step up from the Galaxy Sky, which we expect sometime int he near future and will have a 5.5" touchscreen, but likely cost upwards of $150. 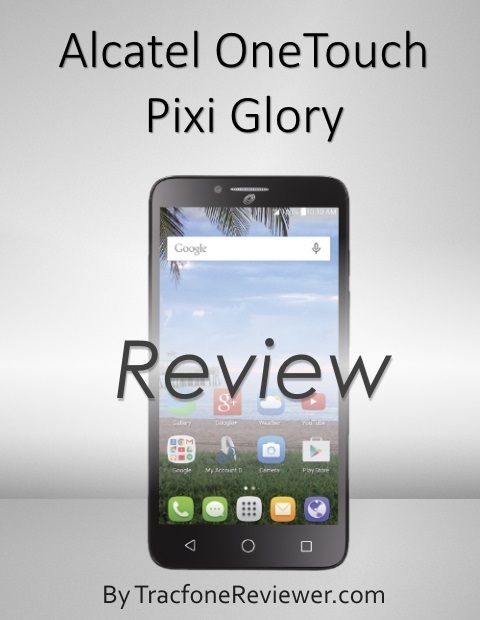 We hope this review has been helpful in providing information about the Pixi Glory. Leave a comment with any thoughts or questions. It may be possible to unlock this phone. For more information, visit our step by step Tracfone Unlocking Guide. And if you're looking for a new phone, don't miss out on our list of the Best Tracfone Smartphones in 2017. Join our community on Facebook where we post the latest news, and check out our YouTube channel where we will be creating more content in the near future! New list of Tracfone Promo Codes updated for April 2017 and provided by TracfoneReviewer.com. If you're new, be sure to check out all the other news, reviews and information we offer. Every month we collect and share new promotional codes from Tracfone for our readers to use. With these promo code you can get 20-300 extra minutes for free when you add various Tracfone airtime cards. Promo codes work on Tracfone's regular airtime cards, they don't work on the newer, smartphone only options. And these codes aren't supposed to work with smartphones, but they sometimes do work, so it is worth trying. If you are interested in a new phone, be sure to take a look at our Cell Phone Reviews which include some of the latest phones from Tracfone. We also just shared information about the Moto G5 Plus, an unlocked smartphone that can be sued with Tracfone BYOP. 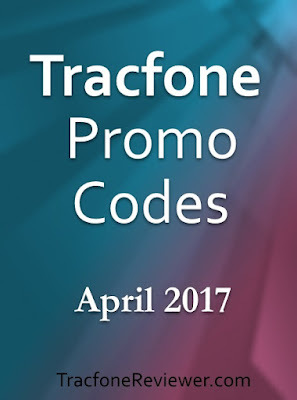 The best way to use a code is on the Tracfone website, but you can also use them on your phone, in the app, or over the phone. If you're looking for ways to track your airtime, be sure to have a look at 4 Ways to Check your Tracfone Airtime. This list includes the newest promo codes for Tracfone, but we maintain a larger list with more codes on our main Tracfone Promo Code page. Let's get tot he coupon codes! Promo codes are for a certain airtime card, but can usually be used with any card of greater value. Some of these codes can only be used once per phone. We hope these codes worked for you, and let us know in the comments your thoughts or questions. If you have questions about Tracfone, or are unfamiliar with how it works, start with our Beginners Guide to Tracfone which will walk you through some of the basics. Find us on Facebook where we have a growing community who are helpful in answering questions ans sharing information. Don't forget about our recent list of great Deals, Discounts and Sales on Tracfone devices and Minutes!